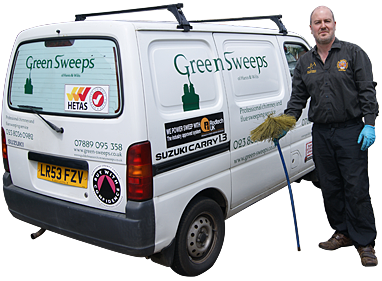 Green Sweeps - Professional chimney and flue sweeping service for Hampshire and Wiltshire. Professional chimney and flue sweeping service for Hampshire and Wiltshire. Tidy, thorough and professional service - ensure your chimney is safe, clean and efficient. Protect against bird intrustion and allow your chimney to ventilate properly - so your fire can burn more effectively.